St. Mary’s Parish was established in 1853 with the arrival in Annapolis of members of the Congregation of the Most Holy Redeemer (Congregations Sanctissimi Redemptorist—C.Ss.R.—Redemptorists). Before then the Society of Jesus (Jesuits), who had been coming to Annapolis since 1704 or earlier administered St. Mary’s as a mission station. The property on which St. Mary’s Church and Rectory are located was given to the Redemptorists in 1852 by four granddaughters of Charles Carroll of Carrollton, the only Catholic signer of the Declaration of Independence, whose birthplace and long-time home is on the property. Conditions of the gift were that “The House, garden, and enclosure back and front, to be always consecrated to Religion” and that Mass be offered once a month for the four donors, their parents, and their grandfather. The original mission church (built in 1822) and its property—where the schools are now located—was given to the Redemptorists in 1853. 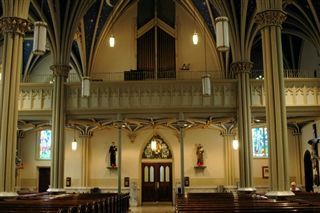 St. Mary's Parish is part of The Archdiocese of Baltimore (AOB). AOB was established as a diocese in 1789, comprises the City of Baltimore and Allegany, Anne Arundel, Baltimore, Carroll, Frederick, Garrett, Harford, Howard and Washington Counties. 1694 Catholic landowner Charles Carroll moves from St. Mary’s City to Annapolis. 1701 Charles Carroll buys property on Duke of Gloucester St., establishes private chapel in his house. 1704 First recorded presence of Jesuits in Annapolis. 1737 Charles Carroll of Carrollton born at parent's house. 1771 George Washington dines at Carroll House. 1776 Charles Carroll of Carrollton signs Declaration of Independence, only Catholic to do so. 1813 Despite threat of British attack on Annapolis and own illness, Archbishop John Carroll visits Annapolis to administer Confirmation at Carroll House chapel. 1817 Archbishop Ambroise Maréchal encourages Carroll of Carrollton to “do something for the future good of Religion” by paying salary of a clergyman at Annapolis. 1821 Carroll transfers title to part of his property land for a church to his granddaughter, Mary Anne Patterson. 1823 First St. Mary's Church opens; served monthly by Jesuits from Prince George’s County (until 1853). 1833 Rev. Charles Constantine Pise, first Annapolitan to become a priest, former chaplain of the U.S. Senate, and renowned Catholic writer, returns as resident pastor of St. Mary’s for one year. 1853 St. Mary’s Church property conveyed to Redemptorists; first Redemptorists arrive to replace Jesuits and establish permanent parish. 1855 St. John Neumann, C.Ss.R., Bishop of Philadelphia, visits Redemptorist novitiate. 1857 Blessed Francis Xavier Seelos C.Ss.R., serves briefly (April 16–May 19) as superior and novice master at St. Mary’s. 1858 St. John Neumann blesses cornerstone and bell for new St. Mary’s Church; St. Mary’s Cemetery established on West Street. 1859 Ground broken for new college building (now St. Mary’s Rectory). 1860 New church dedicated; college building occupied. 1862 Blessed Francis Xavier Seelos returns as rector (June 14, 1862–November 17, 1863); St. Mary’s School opens in old church with lay teachers. 1866 Catholic free school for African Americans in operation. 1867 School Sisters of Notre Dame take charge of St. Mary’s School. 1868 Our Lady of Perpetual Help icon installed in the novitiate chapel. 1878 Parish celebrates 25 years of Redemptorist arrival and establishment of permanent parish. 1880 St. Mary’s Hall opens on site of old church/school. 1898 Spanish prisoners captured in Cuba and incarcerated at Naval Academy visit St. Mary’s. 1902 Two-story wing added to rear of St. Mary’s Hall. 1903 50th anniversary of establishment of parish celebrated. 1907 Redemptorist novitiate transferred to Ilchester, Maryland. 1918 New stained-glass windows installed in church. 1928 St. Mary’s celebrates 75 years as permanent parish. 1929 One-story wing added to east side of St. Mary’s Hall. 1934 One-story wing added to back of St. Mary’s Hall, second story added in 1942. 1946 St. Mary’s High School opens with classes in Carroll House; new school building opens in 1947. 1949 Separate church and school—St. Augustine’s—opens on Bates Street for African American parishioners of St. Mary’s; St. Mary’s Catholic Colored School closes after 83 years of service. 1953 St. Mary’s celebrates 100 years as permanent parish. 1956 Cornerstone laid for new St. Mary’s Elementary School. 1958 Redemptorists’ Tirocinium established at St. Mary’s, continuation of second novitiate training for new priests (until 1969). 1959 New wing added to St. Mary’s High School. 1978 St. Mary’s celebrates 125 years as permanent parish; School Sisters of Notre Dame mark 111 years of service in Annapolis. 1979 St. John Neumann and Blessed Francis X. Seelos windows installed in church. 1984 Ground broken for new wing on St. Mary’s High School. 1989 St. Mary’s Elementary School Fine Arts Building dedicated. 2000 St. John Neumann Mission Church on Bestgate Road dedicated. 2003 St. Mary’s celebrates 150 years as permanent parish. 2010 Celebration of 150th anniversary of dedication of St. Mary’s Church. Rear of St. Mary's church showing organ in choir loK. In 1906 Charles Adams Zimmermann, while longtime Naval Academy bandmaster and St. Mary's organist, composed the Navy's "Anchor's Aweigh", whose refrain opens echoing the melody of the ancient Latin Marian hymn, "Salve Regina''.